As requested, here is the recipe for the Butter Mints we gave out at Christmas. 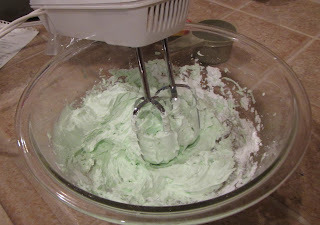 Using a hand mixer, cream butter until light and fluffy. Add peppermint extract and milk. At this point, you can add some food color. Start with a small amount, as you can always add but you can't remove. Still using the mixer, blend in approximately 2/3 of the powdered sugar. 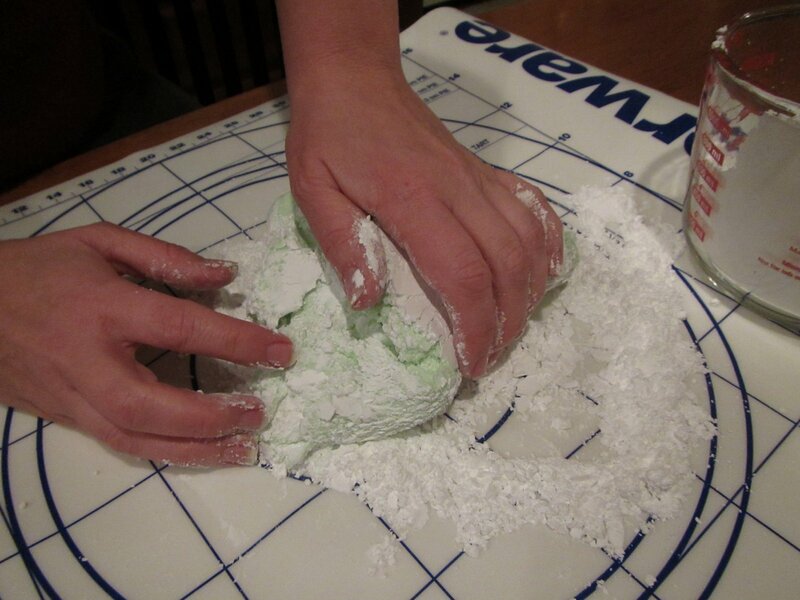 Knead the remaining powdered sugar into the dough. It will be very stiff as you work in the last bit. If you used paste food color (vs. liquid), you may need to add a drop or two of water. Working with a small amount at a time, form the dough into a log. (I learned to keep the extra dough covered with plastic wrap, as it can dry out quickly.) Gently flatten the log on one side, rotate and flatten, and continue until the log is rectangular rather than cylindrical. 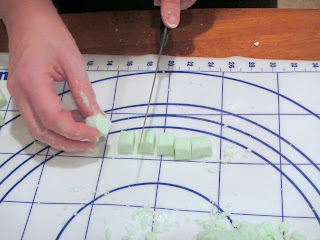 Use a sharp knife to slice the mints into individual pieces. 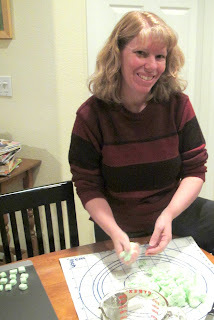 Put the cut mints onto a baking sheet and let dry overnight. In the morning, turn the mints so that the bottom side dries. When they are dry, store in an air-tight container. Enjoy! My mouth is watering. You make it sound so easy, I'll have to give it a try. Thanks for sharing. Are those like the ones they sell at Hickory Farms? If so, then Yummy! I've never had Hickory Farms mints. Something to add to my must-try list! I am totally laughing at the comment above mine. I want to be on your Christmas list too. Very cool post. Now I want to make mints! So yummy!! And I'm with Yvonne!!!! !